The entities which are now Canada were separate provinces and colonies in 1851, ‘Canada Province’ only comprised Ontario and Quebec. Each province had its own postmasters, who were given local autonomy under the 1850 Post Office Act. This gave rise to the provinces’ separate issues, three of which occurred in 1851. Canada Province was the first to issue on 23rd April 1851 with the famous 3d Beaver, designed locally by Sandford Fleming, but printed in New York. The Beaver appeared in many imperforate and perforate variants until 1859. The SG1 sells for £11,000 mint and so the design is illustrated by the 1852 SG8, Sc4 and a 1951 commemorative. 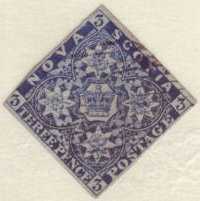 Nova Scotia’s first issue was on 1st September 1851, the world’s first diamond shaped stamp. This was closely followed on 5th by a second diamond stamp from New Brunswick. The designs are identical apart from the province names, and were commissioned in London and printed by Perkins Bacon. 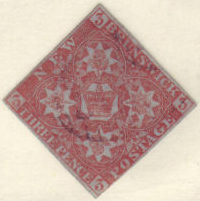 With Nova Scotia, again the first issue is not the first catalogued stamp, the SG1 Sc1 not appearing until 1853. The Canadian provinces issued many attractive stamps, a tradition continued by the Dominion of Canada formed in 1868.The most prolific province was Newfoundland which issued its first stamp in 1857 and did not join the Dominion until 1949. The 1847 Lady McLeod (SG1, Sc1), the world’s first pictorial stamp, was described in the earlier 1840s display, although this is strictly a local stamp. 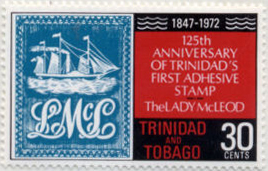 Trinidad's first national stamp was issued on 14th August 1851. Pragmatism has ruled in the post due issue, showing the 1d denomination rather than the ½d which is priced thirty times higher. Trinidad did issue early Official overprints, but the first set are all expensive and not worth pursuing.